So another week goes by, and the weekend is nearly upon us. We thought this week would be an ideal time to remind you (and try to inspire you!) to make a video to enter our competition. We’re giving away three vouchers to three worthy winners, worth £400, £200 and £100 respectively. To get the juices flowing, we thought we’d show you a couple of our previous videos. Joan Allen are giving away up to £700 of vouchers to spend! 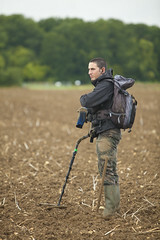 To be in with a chance to win, simply enter your best metal detecting video before Friday 1st March and then an internal judging panel will vote for the best five. Once the top five have been chosen, we’ll then open it out to the Joan Allen community to vote on the winner! The first month of 2013 has ended and once again we take a look back across the previous month’s best finds. There’s a few here from Facebook and one from our Twitter page too… so get liking and following our pages and start sharing your finds!